“Brian Damage, the definitive Pink Floyd radio show” at floydpodcast.com is a FREE, monthly, music podcast dedicated to all things Pink Floyd and anything related since 2005. Each podcast is uniquely and professionally presented around specific themes. You’ll hear deep album tracks, rare alternate demos, and carefully restored concert recordings. This podcast fully licensed under BMI. 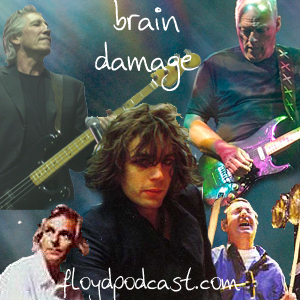 “Brian Damage, the definitive Pink Floyd radio show” at floydpodcast.com is funded entirely by donations from listeners like you. Your donation helps pay for music licensing, domain and hosting fees, site maintenance and security. I’m Matt but you can call me “Doc”. 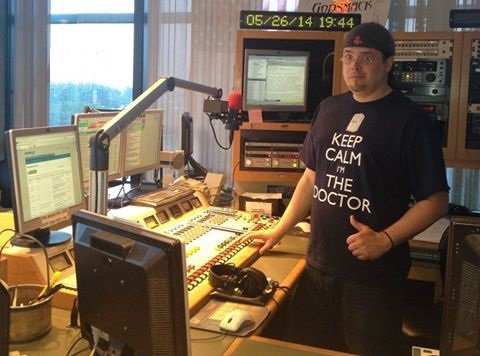 It was a nick name given to me a long time ago when I started my radio career. Yep, I’m the Production Director and Afternoon DJ at The Rock Station 100.3 WHEB in Portsmouth, New Hampshire just north of Boston. Click HERE for more info about me and the podcast. All content featured on floydpodcast.com is licensed under BMI. Website content protected by Creative Commons License. Doc, I just wanted to say that my brother and I were at the Buffalo show last night for Nick Mason’s Saucerful of Secrets show and what a show it was ! I captured the audio from the front row balcony and I gotta say that the raw recording sounds amazing. I’d love to send you a copy and if you wanted to Dr. It up for a show, Im cool with that. I thinks it’s that good, you can be the judge. Just lmk. Been listening to your show for a long time (10 years+) and can’t say THANK YOU enough for all that you do. Keep it up! Thanks Mark! I’d love to hear it. Best way to send the files is by wetransfer.com THANKS! Hello Doc. Was at the Nick Mason show Glasgow Friday 28 Sep 2018.Recorded on my phone,sound alright,but i know you can improve on it,recorded as an MPEG4.If you want it it is yours.Just tell me how to get it to you. I’ve been a long time listener and thought it’s about Ii subscribed. as a massive Floyd fan I thank you for all you do. I was at the last RW show in Vancouver, wait for her, oceans, part of me died was the absolute highlight of the show. I will always treasure being there that night and being the first to hear it live on this tour. A huge thanks for including this at the the beginning of the Desert Trip concert. You would happen to have RW talking to the crowd before he started playing wait for her? Thanks for the kind words Jeff! And, yes. I do have Rogers speech. I have the US and Them audio from the sound mixer June 30, 2018 Hydro Glasow, would you like these for your show.If so let me know how to upload them to you they are in wav format. Was and am a big fan of the Brain Damage site and through them found your site, your stuff is excellent been a Floyd fan since DSOM, when i was 13years old. Hi Paul! I emailed you. But yes please. wetransfer to thedoctor@floydpodcast.com and thank you! I’ve been watching “The Colors of Infinity”, the show that David Gilmour composed the music for regarding The Mandelbrot Set. Do you have any way of including the music in a podcast? One of the themes was used on “The Endless River”. That’s a great suggestion unfortunately I did not think of that in time. Hi John. Glad you love the show! I’ll have to look for those dates. I’m sure there’s something. Hey Doc. Found you from Perry Bax and his podcast. Finally got to check it out and I am now on the dark side of heaven. Sent a donation and bought some swag for me and the Mrs. Wish I could send more right now but my meds are costly. Thanks for all you do. Hi Randy and welcome aboard. Perry is a genius at what he does huh? Anyway thank you very much for the kind words and the donation and for purchasing a couple of T-shirts!! I just found your show, and I am loving it. I have been into Floyd since back in High School when I get introduced to The Wall. That was during the interregnum, and I graduated a few months before A Momentary Lapse of Reason came out. I really appreciate the About Face concert tracks from that one episode. I had a videotape of the concert on VHS, along with the behind-the-scenes documentary (of which I remember two things distinctly, one was Gilmour’s despondence at the tour’s success, which he felt was a lack of name recognition problem (aka, “which one’s Pink? ), and his choice not to advertise his association with Pink Floyd much in marketing, and the strange reason Mick Ralphs was on the tour (they were neighbors, used to talk while gardening and Ralphs asked to go on tour because he was bored as Bad Company was on hold). However, I really like About Face (except Blue Light). It really points to the future of Momentary Lapse. Too bad not many remember it. My name is Ewan Cunningham, I’m 18 years old and I’m a self taught musician. I started playing drums at the age of 4 and now I’m branching out into other instruments such as guitar, bass, keyboards and vocals. I’ve been teaching myself to mix, record and film music since I was 10 years old and this is my passion. Fantastic work Even. You can tell you’ve studied your Floyd. Very well done! Hey man how are ya? I understand you are a PINK FLOYD expert? I owned an indie record store for about a decade from 1988 on and bought product direct from the labels. I have an item that is not in front of me at the moment so I can’t give specifics…..It’s been in a bank vault since 1990. I purchased an import CD SINGLE called ON THE TURNING AWAY. It’s in a thin CD SINGLE type case…..it has a catalog #, etc. Anyway……..it’s supposed to have 3 tracks if my memory serves me correctly……………. The CD has no info about the BEATLES. Have you ever heard of this piece? It’s NOT a bootleg!!!! The label actually tried to buy the piece back from me months later for $500 but I said no thanks…..I’ll hold onto it. I have not. Sounds like a printing error. What Beatle songs are on it? I think it’s one of the past masters albums. Any clue to how many of these there could be and why one has never appeared before? Hello Igor. Thanks for the kind words. The “gotta go with the flow” was spoken by Polly. Its taken from the extra features on David’d “Remember That Night”. DVD while they were in Venice when they came upon the glass harmonica player on the street. I love The Endless river. just found this site. Man, that’s brilliant, thx a lot for the hard work. Keep running it, you made my day!!! Hey Doc, i just got turned onto your podcast through another really good podcast (BRYHNH). I saw someone asked how to download thru itunes, and your answer worked great for the episodes from March 26 thru the present. Any ideas on how to download into itunes the older episodes? Thanks for all the great Floyd music. Thanks for the comment. Tell Perry I say hello. Did you check the settings for the RSS feed on the subscription to see if you are DL’ing all episodes? Thanks, Doc. I checked the RSS feed and it looks like just the most recent 9 podcasts are a part of the RSS feed. The rest have to be downloaded/played individually as opposed to being able to save them in my itunes. Let me know if that makes sense. Yes. Sounds right. That’s how the new iTunes is configured. He Steve! Sure… Here’s my favorite Animal. Is it possible to download (legally) the podcasts to iTunes on my iMac so I can refer to them and play them any time day or night? Yes, you can (legally) listen via iTunes. If you come across a podcast like mine on the Internet that you can’t find in the iTunes Store, you can still subscribe to it. In iTunes, from the File menu, choose Subscribe to Podcast and enter the podcast feed URL. iTunes subscribes you to the podcast and begins downloading immediately. Hope this helps! Also…..years back I downloaded several shows (100 – 130) on my old Windows machine to a thumb drive….but when I tried to play them on the new iMac they don’t play….but they still do play on the old windows machine. Is there any way to transfer them to the new iMac or CD so I can play them in the truck? P.S. I was an early donator back on the old site. Hey Bob. Thanks for your support in the past and I hope you like the new site. If you’re unaware, the donation button is on the “about” link at the top of the page. About the thumb drive. Are they mp3? What kind of fine are they? I just wanted to say THANK YOU…!!! Being a musician and collector of music, for most of my 56 years(ouch! ), I would like to think I am qualified to make such a statement…I recommend you to all of my friends and associates…KEEP UP THE EXCELLENT WORK…WELL DONE…!!! Doc, Welcome back. I want to donate but am paranoid about using credit cards without paypal or a secure payment method. Maybe send to you directly? Anyway, I tried the RSS podcast link. It worked OK back to the may show, 184 or 185. But no archived beyond this date. I was able to modify a past show url, 10/31/10 by using your new http address from the 2010 October download URL. Any way to fix this???? Thanks Steven. My donation provider, Clover Donations, is very secure. Theres no way around the limit RSS feed will allow. you’ll have to manually download the other shows and add them to your iTunes. Good news, the Doc is back! Thanx for the early Christmas present. Like your new site, and I’m looking forward to lots of great podcasts. Keep up the good work. So good to have you and these great podcasts back. 35 years a fan of Pink Floyd but still you dig up material I have either never heard or long forgot about. Received my indoctrination waking up in the middle of the night to hearing Us and Them on the radio in the middle of the night. Have been hooked ever since. I am so thankful that I am now able to finally listen to your podcasts. I am hearing stuff that I’ve forgotten about, haven’t heard in years, or have never heard before. And I thought my personal archive ran pretty deep. I love the fact that you are willing to dig into the far obscure corners of the band’s body of work and surprise the hell out of me. Thank you for doing such a great job!